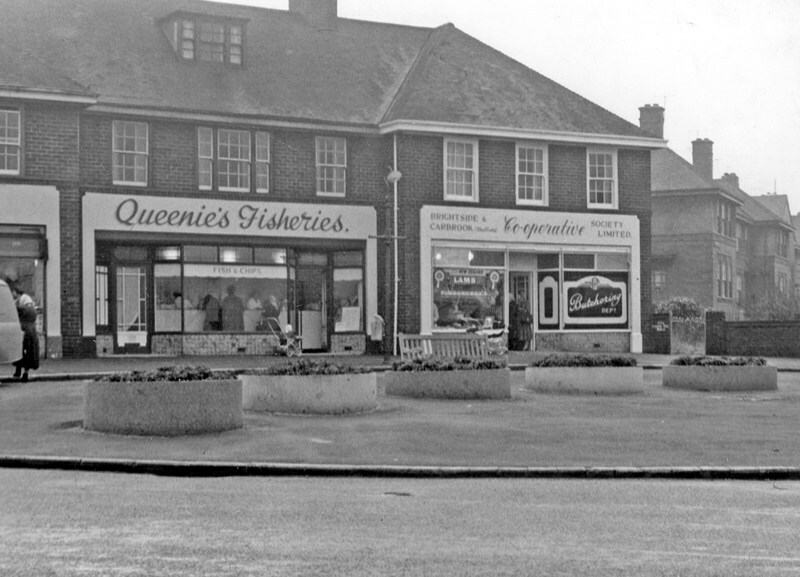 Wasn’t Queenies on Hartley Brook Road? Used to have half a cob (round loaf, not BBC) filled with chips for dinner whilst attending Hartley Brook in 1968. Yes, you are right!!!! Ageing memories!!! Not Nethershire Lane!!!! Anyway, does anyone remember the Fuscos? Well, I don't remember the shop but the Fusco's I do. The owner was Noel Fusco and he worked, back in the 60s, at Block and Anderson. Initially, he sold calculators but then moved on to electrostatic copiers. I know all this because I followed him into the Block and Anderson company. I first knew the chippy some 65 years ago in 1953/4 and I seem to think the place was owned and run by a family of good looking, dark haired, Scots of Italian extract. The "fryer" was a large moustached , smiling bloke whose surname I thought was something like Gabrielli. ( I am not confusing that with the Gibbons who had the chippy at the end of Nethershire Lane) I don't recall Fusco at all. The 1967 Phone Directory has an entry for N.Fusco, Fish Frier 122 Hartley Brook rd, 5 Sheffield 385570. The 1983 directory has exactly the same entry. I hear what you are saying, but I was referring to a period predating 1967...I had left the area some years before then. To be honest back in the 50's we kids knew them as Mr and Mrs Queenie! Clearly, I do not know when Noel Fusco passed. Perhaps the dates above could give us some hint. Then it must have been Albert Vettesse and his family who ran Queenies when I was around....Whatever ,50 and more years on I still reckon they were amongst the best fish, chips and fish cakes I have ever eaten...and I have had just a few in my time! Yes, that is Noel as he was and his appearance is amazing after all these years. That certainly looks like the man with the moustache I knew from 1953 to 1965 but, I wonder , why does the name Albert Vettesse appear in the 'phone directory at that address...as a fish frier...during the years 1952 to 1966? The Mr "Queenie" I knew , looked extremely like the man in the picture , said to be of a uniformed Noel Fusco. His bride also bears a striking resemblance to the Mrs Queenie I knew who, incidentally, spoke with a pronounced Scots accent ( hence my belief they were Scots-Italians) From the photo I do recognise that a similar looking couple were both at the fish and chip shop during the period I mentioned( 1953-65) and the name Albert Vettesse also appears in the phone book for the same period . So, I wonder, where does the name Fusco come from?...He couldn't be the same man I knew as the dates are wrong and he was said to be working at Block and Anderson in the 1960's The name Fusco appears as the owner of the chippie in 1967..not before. Could it be that Fusco took over the shop from Albert Vettesse...but where does the photo fit in? 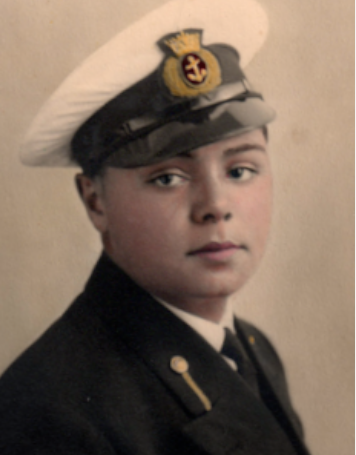 Incidentally, the photo appears to be of wartime vintage and the rank shown on his sleeves is that of a warrant officer in the Free French Navy...and Vettesse does have a French "ring" to it. I am becoming very confused! The photo bears a striking resemblance to the "Mr and Mrs Queenie" I knew at the chippie from 1953-65.... which would, according to the evidence from the phone book, make them to be Mr and Mrs Vettesse. Mr Fusco, apparantly, first appears in the phone book in 1967 and was said to be working for Block and Anderson during the 1960's...so the dates are wrong for the "Queenies" I knew . 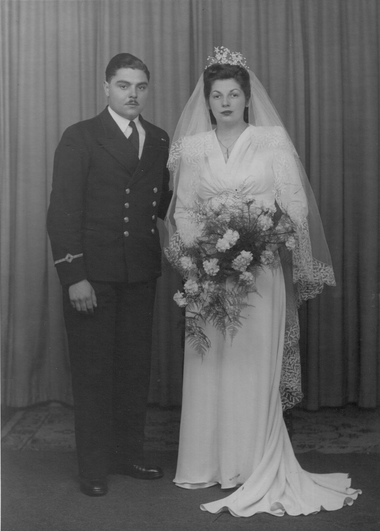 Incidentally, both Mr and Mrs Queenie spoke with a pronounced Scots burr and the photo is probably of Wartime or just post War vintage and appears to show what could be a young naval warrant officer.I wonder was Mr Fusco ever in the navy? .I wonder was Mr Fusco ever in the navy? So here we do have a mystery. The wedding picture looks like Noel Fusco to me but the other names are an enigma to me. Yes, add a moustache and we could have...Albert Vettesse ( of earlier phone book dates for the chippie) or, we have Noel Fusco who was working for Block and Anderson and was at the chippie in 1967. A mystery surrounded by an enigma! I wonder from where Edmund and Blackmacjay have obtained their information and photographs...are they related to the families??? No, I first met Noel Fusco at Block and Anderson around 1962. Then he moved into promoting the sale of electrostatic copiers made by Smith Corona Marchant. The last I saw of him was in 1966 or thereabouts. So, no I'm not related but just via work. The 1962 phone directory shows that Albert Vettesse was the fish frier. I wonder, could he have moonlighted at Block and Anderson under an assumed name? The man I knew at Block and Anderson was/is Noel Fusco. Whatever other names he had/may have had is beyond my imagination. It also occurred to me that, if we can find one of their children, they may be able to clear up the "mystery".